Banda Sea is one of the few places in the world where you can see large schools of hammerhead sharks. Find out more at out destinations page. A day before my trip began, i packed my snorkel mask and snorkel fins. At the next evening, we went to the airport of Halim Perdana Kusuma,whereby then i said goodbye to my parents. After saying goodbye to my mom and dad, I went to find my grandfather at departure gate,then we went inside to wait for the air plane.I flew with Batik Air,and it went take- off at 10.30 PM from Jakarta. The destination said i went to Sorong – Papua, but i had a transit at Makassar airport – Sulawesi. From Jakarta to Makassar was only 2.00 hours.We were arrived at Sultan Hassanudin Internasional Airport at 2.00 a.m., then at 4.00 a.m we went to Sorong. The flight was only 1.30 hour. Arriving in Sorong, our car took us to the Port.I saw many houses with solar panel, then there was a speed boat take us to the Blue Manta ship. After arriving at the ship, we went to our room to put our bag. After we put our bag, our cabin is cabin number 14 in the first floor. We went to eat the breakfast, the breakfast menu is omelete. After having a delicious breakfast, we went to the bridge, then we had a briefing. The first person i met was Cedric. Not long after briefing, we went snorkling with a speed boat while the other tourists went for a scuba diving. We saw many corals, but we saw a few fish. The corals were many. The colour were red, green, chocolate and yellow. The texture were soft, rough and spiky,but i didn’t saw any single shark. Then we went back to the ship and had lunch.The lunch menu was crabs with saos Padang. Then the ship was moving to the west. After lunch, i went to the bridge and i helped the captain to look in the map where was our position. The wind was very strong and the current was strong, too but the wave was slow. I liked the wind because it made me feel calm down. After that we got a suprise... All people on the ship went to the bridge,but what was the surprise? It was a group of dolphin... A lot of dolphins, that everybody looked the dolphins in front of the ship. When i counted the dolphins all were 22. After that , i went to the sundeck.We relaxed with drinking soda and after that we fell asleep. I was awake,but my grandpa still sleeping then i helped the captain to look where was our position.Night dinner and we ate a steak,then we went to our room to sleep. The next day & finally we’re on Raja Ampat and now its time to briefing. Cedric introduce the whole crew. After briefing, we ate breakfeast and the menu was toasted bread.After that, we went snorkling in Raja Ampat. We went with a speed boat. While the others dive, me and my grandfather went snorkling. The water was very sparkling and very clean. There were so many fish but i still didn’t find any shark but the coral was excellent. There were so many shapes and colours. There were blue,red,pink,yellow,green,chocolate and black. We saw a sea horse, too. After that we go to the speed boat. The speed boat drove us to the Blue Mnta ship again. We ate lunch, the lunch was yummy steam fish. After we had lunch, we went snorkling again, the others were diving.This time i found a small shark this time the sharks was only three but not bad, at least we found a shark but we used the mouth mask. My grandpa tried to fight the current but the current pushed us 50 meter. At last Cedric saved us.We were lucky. Cedric helped us. I saw a mangroove there, the roots were very big. The roots went under the water. After snorkling, we went to the ship. There were already hot milo cups in the table for all of us. I went to the bridge then it was already night. That day was a special menu because it was Chrismast night. We ate BBQ and there were turkey,duck,chicken,goat, cow(like the whole animals in the zoo, as my grandpa said!!! ...) and also of course fish and shrimp.Then we went to slept, but the other tourist still having a party. The last day on the ship. It was time for briefing, after briefing we ate ommelete again. After that i went diving. Cedric taught me how to dive. I only went down 2-3 meters from the surface the depth was only 5 meter .Cedric said there was only one fish that only eat and catch insect like fly and mosquito. The coral was moving like a hair and making a little bubble..
After diving, we ate fish for lunch. After that i went to a mountain. The view was delightful. After that we go to the exausthing stairs again, then since it was a hot day so we decided to swim free. Then the speed boat took us to the ship again. At the ship, i went to the bridge then i went to the sundeck with drinking a soda can. I saw there was a tourist who already wrote and drink 7 bottle of beers.But there were so many flies in the sundeck. But how can flies flew to the sea? Then its already night. My grandpa went for a night dive. At the ship, we watched National Geographic. After my grandpa finished the night dive, we ate dinner at 8.00 p.m. The menu was salmon grilled with mashed potato. Then, we went for sleep. On the last day we packed our own bag. After that, we ate breakfast. The menu was toasted bread.I choose peanut butter. After breakfast, me and my grandpa said good bye to the whole crew and all the tourists.We went to Raja Manta and my grandpa gave a briefing in the bridge with the whole crew of Raja Manta.But oh, oh i forgot my book,and i forgot to take a picture of my grandpa having a briefing.After that we went to eat our second breakfast.The menu was seafood fried rice.After that we went to Wassai capital city of Raja Ampat. We rode a speedy ferry ship in a V.I.P room. Then we arrived at Sorong and there was a car like in the first day. The driver took us to the seafood restaurant named Ratu Sayang. After we ate the seafood, we bought souvenir. The souvenir was Batik Papua. After that, i went to the airport,but don’t ask me because i forgot the name of the airport.Next, we were boarding at 2.00 p.m. Our plane flight was in 2.30 and then we had a transit in Makassar Internasional Airport of Sultan Hassanudin. There, we bought a Starbuck coffee and i read surah Ghaffir/Al-Mu’min while waiting for our plane.Then,it was the call of our flight. The flight duration was 2.00 hour and then we arrived at Halim Perdana Kusuma.We went outside the airport of Halim Perdana Kusuma, after that i met my parents then i said how i missed them. From my wonderful trip i have learnt that we must take care of our environtment and i have learnt how to navigate in a map. Sangalaki & KM Raja Manta - the best diving trip I have enjoyed in 30 years! A dive safari through the islands found off the Eastern coast of Kalimantan in Indonesia provides a most interesting dive route due to the diversity of the wildlife and stunning scenery that we can experience in a short period of just a week. If you ask me, I think this route is the most worthwhile dive route when compared to the cost of travel, because it's like we've been diving in a lot of places all in just one destination. In just one week we can find a shiver of Blacktip sharks (many people call Oceanic Blacktip), a cleaning station of Thresher sharks, a jellyfish lake the like of which is found in just a few rare spots in the world, swimming with thousands of non-stinging jellyfish. There is plenty of macro life here too, such as the pygmy seahorse, many types of ghost pipefish, a variety of species of nudibranch and more to be discovered. We can find sea turtles and manta rays, even enjoy the fellowship between fishermen on a large bagan boat with a pack of whale sharks, waiting to eat the small fish discarded by the fisherman who have formed a clear bond with these gentle giants. The KM Raja Manta is one of the best diving vessels I've ever been on (Although I haven't been to the Blue Manta yet!). The boat is so nice & new. Even in strong winds the boat is stable & safe with no rocking. The dive deck is large & spacious. The dive deck is so important, it’s the part of the ship we use most on the boat and on many other dive boats I’ve felt cramped & squeezed when getting ready for a dive. Not on the Raja Manta, we have so much room for everyone! Raja Manta uses 3 support vessels (rubber dinghy’s) to take the groups to the divesites, meaning the dive deck and dive sites are never crowded. Each dinghy has a place to put the scuba tanks & equipment, making it so easy to gear up & go diving with no hassle. The spacious bedrooms have a table for assembling cameras. Every Upper deck & Main deck bedroom has a bathroom which is spacious, and kept very clean. The crew clean the boat and the bathrooms everyday, it’s so nice to see everything taken care of. There are also two large bathrooms on the dive platform at the end of the boat, which come in very useful after a dive! All of the crew are super friendly and make us feel so welcome. Compared to the number of guests with the cabin crew, there is almost a 1:1 ratio, making every service on the boat quite smooth. This has been one of my favorite routes so far from my 30-year dive experience. Thank you to the Raja Manta crew, Nu Parnupong and all the crew from Dive Me Crazy for such an amazing trip. The best crew we have ever encountered! We are now back at Lembeh after what was an absolutely amazing trip onboard the KM Blue Manta. The crew were absolutely amazing. Louise and I have been on many liveaboards around the world and we are both in agreement that the crew were the best we have ever encountered. I never thought that the level of service could get better than what we have previously had from a couple of other liveaboards but the guys on the Blue Manta have raised the bar. Each and everyone of them made my group's holiday even more memorable than the fish and corals. The boat was very comfortable with plenty of space for those moments when you wanted to find a nice quiet spot to gather your thoughts. I hope the crew enjoyed my group's company as much as we all enjoyed theirs. The food was delicious and the buffet style lunch and the plated serviced evening meal was a great way to do things. The only complaint that I heard about the food was that it seemed like we were always eating. I made a point of asking the vegetarians within the group if they were happy with the choices being offered and all of them were. BBQ night was without doubt the best night that we had and it was a meal that will stay in my mind forever. The organisation on the boat was top rate and big thanks to Evan for all of his hard work that he put into everything. His knowledge of the area was amazing and it was great to get dive briefings that were simplistic but full of the correct information. Sometimes dive briefings can be information overload and hard to digest the information. With Evan it was very well structured and all queries that were asked by my group were answered. The boat itself as you know is the perfect liveaboard, spotlessly clean, big and very comfortable for a large group of divers. The crew on board worked extremely hard to maintain the boat with their daily duties. The dive boats were also very comfortable, particularly the 2 white ones that have the tank holders. Diving from these was great. Once I return to the UK next week I will take a look at the information that you supplied regarding another charter and I will get some prices back from you. Thanks for all of your help in everything that you have also done throughout the booking process Max, and I look forward to dealing with you again in the near future. White Manta Diving - World Class! White Manta Diving have truly redefined the concept of luxury liveaboard diving. While most of the liveaboard operators in Indonesia use a wooden phinisi made from iron wood illegally logged from Kalimantan, White Manta Diving sets high safety standards through their steel hull liveaboards built with comfort and diver safety in mind. As a customer who have been on the 1st White Manta, Black Manta and also the Raja Manta, I’m proud to recommend WMD as the ideal liveaboard operator when it comes to world class diving experience. Keep up the great work guys! I left Ambon and I have been on this AMAZING yacht sailing the forgotten islands and the ring of fire for the last few days. To my non-diving friends, this is life on a live aboard. The KM Blue Manta is a huge yacht, there are only 21 divers on the boat and 21 crew. The crew are all Indonesian young men and they work to make sure we don’t even lift a finger. This boat is AMAZING. I have been on live aboard boats before and this is by far the very best of all I have visited. The Cruise leader is Cedric. He is a native French man who has the heart of an explorer. Many of the places that we go, Cedric personally finds. He tries to take us to the MOST remote places so that we are the only boat in sight. Problem is that word gets out and we seem to get some other boats following our path. So today, we are going to explore a place that he hasn’t been in two years! I can’t wait. Let me tell you about my journey on this trip so far. The boat: This boat is four stories high. The lower deck has a few guest rooms, the laundry room and the crew room. My room is on this lower deck and I don’t mind at all. It is HUGE and i have it all to myself. It is my own little piece of heaven. The second level has our dive deck, the kitchen and living area. It is decorated in neutrals and natural wood with cozy leather sofas and a big screen TV where PJ, our awesome videographer, displays drone shots of these AMAZING islands we are visiting. The food is Indonesian, fresh and amazing. We are constantly offered snacks, drinks, coffee…. Last night we had sashimi. These 21 crew members open doors, grab your empty glasses, carry EVERY ounce of dive equipment including my huge camera. It is all done with a smile. On this boat, I feel that every member wants to be here and every member wants to make sure each guest has an amazing trip. The dive deck has all of our equipment set up for us. The crew carries it into little dingy boats ( which I LOVE to bounce on!!) and all we do is jump into our wet suits, hop on to the dingy for our underwater adventure which is no more than two minutes from the big boat. More on diving in a bit. The second level also has lots of the cabins for guests. Third level: An open air covered deck with snack kitchen and refrigerator to relax, and more guest cabins. The fourth level is my favorite. A covered deck with queen sized beds to relax on between dives. There is also an area that is in the sun for brats like me. Our schedule: this is easy: Wake, coffee and light snack DIVE breakfast DIVE Lunch DIVE snack DIVE dinner SLEEP. We travel when we sleep. Our fist days were spent in the forgotten islands. These are remote islands of Indonesia that are rarely explored. That is why they are called forgotten. We visited some of the most colorful and beautiful reefs I have ever seen. I never wanted to come up from any dive. If I had gills, I would live underwater. We saw beautiful schools of barracuda, jacks, and the most gorgeous fish. The marine life here is so very diverse compared to our side of the world. We visited a small village on one island called Dawera. 300 people live on this island. When live aboard boats visit the island, guests and our crew leader bring gifts. Toys,clothes, anything… This time, a HUGE white board was brought ashore for education. The people of the island performed a song and dance for us. It was breathtaking. While they were entertaining our guests, I went around and took pictures of the children, and the mothers and fathers. They loved having their photo taken and then being able to SEE it on the screen of my camera! Such a sweet and loving little village. Next we headed to the Banda Sea and the RING OF FIRE. The first island we visited in the Banda Sea was just so beautiful. Three mounds rising from the ocean. This island is known as a spice island. Only 70 people inhabit the island. They are lucky if they get shipments from the mainland twice per year. They live a simple life off of the land. Right now is the harvest time. Villagers climb the mountain and harvest cloves and nutmeg (I think). They have no need for money, because it is of no value here. They cannot do anything with it. They survive on the land and sea and trade of the spices. The ring of fire is an archipelago of active volcanos. We woke and many of the guests could smell the sulfur. Smoke seeped from the ridges and cracks of some of the mounds. The sand underwater is black and if you put your hand in it, a few inches, you can feel the heat from the volcano. SO FLIPPING COOL. We did four dives here and experienced some of the COOLEST things. 1. HAMMERHEADS. Gobs and gobs of hammerheads. We were very deep, in fact this is one of the deepest dives I have done to date. 122 feet below. I know, right? What I liked, but didn’t like on this dive was the many many sea snakes. The snakes are 4-6 foot long. There are two types: the banded coral snake and the olive snake. Look them up if you are curious as to what I am diving with! They took a liking to me and were often found swimming between my legs and wrapping themselves around my camera housing. This I did not like. Snakes and spiders will never be my friend. We also got to witness something very cool. Look up in google, Barrel sponge. These are large purplish pink spongy barrels that you can stick your head in….hahahha..> Some of them are so huge you can stick your whole body in them (note:we do not do this!!) Normally, these barrel sponges are home to crabs and fish and they are just sitting there. This day, they were SPAWNING!!!! Almost all of them were spewing sperm and egg into the ocean. they looked like volcanos themselves blowing loads of white sediment from their large openings! Yes, I have pictures…. We swam to the deepest point, and it was hit or miss as to weather we saw hammerheads, but that is nature! Many groups saw them throughout the day but for me, it wasn’t until the very last dive….then I was blessed. I was paralyzed with wonder and amazement as a group of 20 or so swam by quickly and then returned two more times. To see these giant creatures, with hammer shaped heads and eyes protruding out of the side of the hammers is a feeling I cannot even describe. I can only say that it lasted seconds and I will forever hold the image of these 10-12 foot long strong, powerful creatures swimming in their natural habitat. We are so blessed to visit their home. I would like to say a big thank you to my dive buddies: We are all linked together by Aldora Divers and Liang Chen from Cozumel. I am the only woman traveling alone. In fact, I am the only person traveling alone! I have felt so welcomed and loved by all. I have made many new friends. Thanks to Cedric & the Blue Manta Crew for such an amazing adventure. KM Blue Manta - the only way to dive! Hello KM Blue Manta team, I just want to say you that guys have ruined all other dive trips for us! After our amazing experiece diving in Raja Ampat with the Blue Manta we decided to do a dive in Maui and we were so sad! We were so spoiled and had such a great time on the Blue Manta with the exceptional service, attention to detail, and just overall vibe of the crew and dive staff that all we talked about was how great we had it on the Blue Manta. Every time we look at each other on the Maui dive boat, we just shake our heads and had that look of wishing we were back on the Blue Manta. I am sure you guys hear this from past guest often and we are not the first but we just had to let you guys know. We are now looking forward to our next trip with the Blue Manta and just cannot wait to be back onboard! Until then we hope everyone at the Blue Manta has a great season. Trip: Sangalaki Maratua & Kakaban Author: Raja Manta guest, Mike. I am now back in the UK and rather belatedly, therefore, I wanted to say thanks to you, Andreas and all the crew for a great trip. 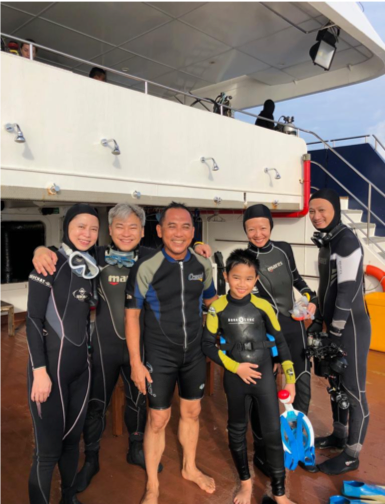 Previously I have only been on White Manta for weekend trips out of Singapore, which are not the same thing at all, and I could not believe how hard you worked to make the trip special for all of us. And I do appreciate the responsibility too, I could see how invested you were in the sucess of the trip when we could not initially find any whale sharks. I can see how you can handle all that for a week or so, but to do it time and time again is a huge effort, and I don’t know how you did it. I had a wonderful time, and am keen to have another go in due course, we have discussed making another trip in a year or so. It was a very special experience. Thanks, too, to Andreas for unobtrusively keeping an eye on the old man. Great guy. Please pass on my thanks to him. All the best and good luck for the future to you and the whole crew of WM. We just wanted to say a massive thank you to both Max in the office and Cedric who ensured we had an amazing second trip on Blue Manta... we are very keen to get booked up again! We were so happy to arrive on the boat and have the cabins we had requested and have Cedric as our DM again. Cedric is a fantastic host and we have such fantastic memories from both our trips. The whole crew worked tirelessly to make sure we had a wonderful time and it was lovely to see the same crew present as last June and that many of them remembered us. We can't wait to get back and hope to join all the crew on KM Blue Manta soon! A massive thank you to all of the Blue Manta team. I just wanted to thank you again for all that you did to make this dive trip one of the very best I have ever experienced. I enjoyed meeting and getting to know new friends on this trip, as well as re-establishing friendships with those that I already knew. A trip like this makes me want -to dive more! I certainly won’t wait another 2½ years for my next dive. The diving on the trip was incredible. Michael, the Dive Master that led our group, is one of the best I have dived with. He showed us so many incredible macro creatures on every dive. Plus, he’s just a really nice guy. Each of the 26 dives that I did was special. Of course, getting to see a whale shark, 3 pelagic manta rays and innumerable other sharks, along with diving the fantastic swim-thru and unbelievable cave were pretty special as well. Michael and Cedric, along with the other Dive Masters and crew, were all were all very professional and helpful in every way. I would dive with any of them again and hope to do so some day in the future. The Blue Manta is a very luxurious and comfortable ship, obviously designed with diving in mind. The crew and other staff couldn’t have been more customer service oriented. Being a person with diverse tastes, I really enjoyed the local dishes served at meal time. Again, thanks so much for this incredible experience! Blue Manta & Banda Sea; Incredible diving, amazing boat! I had a really lovely time on board the Blue Manta and my word, what a comfortable boat she is! The diving was incredible, with the Banda Sea and Forgotten Islands for sure places I would like to come back to. The crew were all great, very friendly and very helpful - I've never been on a boat where someone washes my wetsuit after every dive!! Thank you so much to all of them for their never-ending hard work, always with a smile. A special and very huge thanks to the chefs who always made sure I had more than enough to eat with my "special dietary requirements" I really appreciated their continued effort a lot!! And I have to make a special mention of fresh salad every meal for every single day, I don't know how they managed to keep it so nice and fresh but it was really a very nice addition to the meals. The boat is super comfortable! The cabins are insane - bigger than most hotel rooms :-) And been kept very nice and clean every day. I thought it would be nice to change the cabin towels half way through the trip. The dive deck and swim platform are both very comfortable and well-equipped, very easy to use and spacious. It was really nice to have a dedicated swim towel, which were laundered after each dive - a very nice touch to have a hot towel waiting for you after a dive! Once again, a huge thank you to everyone who made this a very memorable trip. Komodo Smiles! Thankyou for Everything! You guys are amazing, we have been delighted to receive all the care, attention and hospitality from everyone of you! This is a wonderful crew and one of our best diving experiences. Appreciate very much the care and attention of the crew. Good diving sites, good hospitality, good hygine, good people, good food! We all felt warm and delightful for the entire trip! Thankyou for cleaning our room, washing our diving gear, assisting us as we geared up for every single dive, and assisting us when we got back! 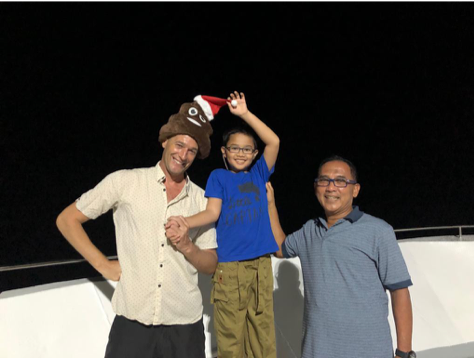 Thank you and the wonderful staff and crew of the Blue Manta for helping make my recent group trip to Komodo a smashing success for me and my customers. I have led over 125 group trips over the last 35 years, and this trip certainly ranks among, if not, the best. Your boat, crew, and operation were the primary reason. Yes, we also were very fortunate to have great weather and water conditions, and no logistical issues with flights, etc., but it all started with the boat and crew. Cedric is a very talented and skilled cruise manager. He has that rare ability to make sure everyone is happy while at the same time deal with each person’s requests, questions, and needs efficiently and cheerfully. He runs a “tight ship” and the crew operate flawlessly under his management. I hope he is still there when we sail in 2018. The boat herself is wonderful with attention to detail I rarely see even in the nicest dive resorts. Large cabins, comfortable beds/bedding, good A/C and lighting, and a spacious bath with plenty of hot water. The salon and dining area, deck bar, and sundeck are all very comfortable and provide enough space for those who want to have some privacy and quiet a place to retreat. The personal dive lockers and gear up areas make pre-dive preparations easy and comfortable. Service is amazing throughout the boat, but especially by the dive staff. The divemasters are very skilled and personable and the dive deck crew goes above and beyond the level of great service. They would appear to help with zipping wetsuits, removing wetsuits, cleaning gear, and wrapping a towel around your shoulders after you get undressed and showered. They air dry the cameras and are regularly cleaning the dive and stern decks to reduce slipping. Wetsuits are kept clean, hung up and dried so the boat is free of “wetsuit smell”. It was fun to have them greeting each skiff returning from a dive with cheers and smiles. The food was very good with plenty of variety and served promptly at meal time. The tea and juices waiting on the dive deck after a dive are a nice touch, and the post dive snacks were really special. The galley and wait staff never missed an opportunity to refill water, clear plates, or respond to a need. The only slight inconvenience was the lack of an icemaker in the main salon, but there was ice at the outside bar and the crew would bring ice down to the salon and refill a bucket, so they compensated as best as they could. The barbeque night was exceptional. Some other nice touches to the trip was the free laundry service, the massages that many in our group raved about (I did not get one, but was told I should have), the central music system, the camera room that opens both to the salon and dive deck, and the opportunities to visit the dragons on the beach and hike to some great vistas. There is no doubt you have raised the bar for exotic liveaboards with the Blue Manta. We look forward to bringing another group for you to spoil in 2018 and recommending your company to all of our clientele. I just wanted to let you know how my trip last weekend went on White Manta to Tioman Island. Without a doubt it was a 10/10 Experience. The food, the service and the diving were all amazing and one of the best experiences I have had. From my initial contact with you, until we left the boat at the terminal after arriving back in Singapore, everything was so professional and well organised. I really can't say enough, thank you so much! I know the White Manta is off to Indonesia so I am grateful to be on one of the last trips to Tioman. I hope to join you guys on another trip one day. Wow! I give it 99.9% perfect, A Fantastic boat with amazing crew, incredible food and most importantly very focused on safety. The Crew was the best, The Girls looking after us throughout the trip were also great. I have to make a special mention of the dive deck crew & chase boat drivers who were the best ever. Our group never waited more than a minute to get picked up, which for me is the number one, most important job on the trip. I hate wondering if someone sees me, I have been left before for long time, once for over an hour so it is always in the back of my mind. The Dive sites were really nice and well choosen by our amazing Cruise Leader, Cedric. The Boat is just amazing, Food could not get any better... This is the first time I gained weight on a diving trip! My husband and I both loved the Blue Manta trip in December! I think our overall experience was superb, we cannot think of any negative thing to say! Since our departure we have already promoted your company to all of our friends, we never know, maybe one of our friends will be your guest in the future, we are confident they will have an amzing time with you on the Blue Manta! Thank you Vincent and the whole crew of Blue Manta once again for the friendliness, knowledge and work to make our dive trip unforgetteable! I was fortunate to enjoy the maiden voyage of the Blue Manta, crossing the Banda Sea. The diving exceeded my expectations; schooling hammerheads, mammoth mantas and the amazing biodiversity of Raja Ampat. This was a trip of a lifetime!! This diving trip had everything, whilst the big fish mentioned earlier provided some amazing highlights, there was so much more to enjoy! I love the smaller critters too, pygmy seahorses, nudibranch, crabs and shrimp, we saw lots of those. The profusion of soft corals blanketing healthy reefs provided many spectacular underwater vistas. Time above water was pretty nice too; the Manta team has done a great job with the design and implementation of their new jewel, the Blue Manta. These guys have been operating dive boats in SEA for many years and that experience is clearly reflected in the Blue Manta. The boat has everything you might want and is spacious, comfortable and convenient. The diving was great, the new boat is fabulous but it is the staff on board that makes Blue Manta the best. The chefs are outstanding, the boat crews are well organized all the staff are experienced and professional. These guys work hard to ensure that divers enjoy the best possible experience every day, above and below the water. What a pleasure to enjoy a great dive vacation with the best team on the water. Excellent!!! 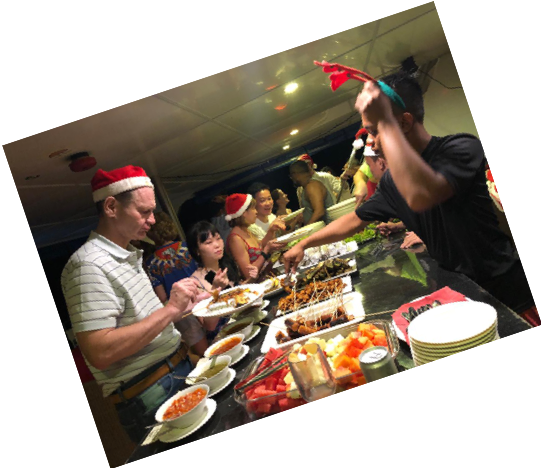 An Awesome Xmas trip onboard the Blue Manta in Raja Ampat. 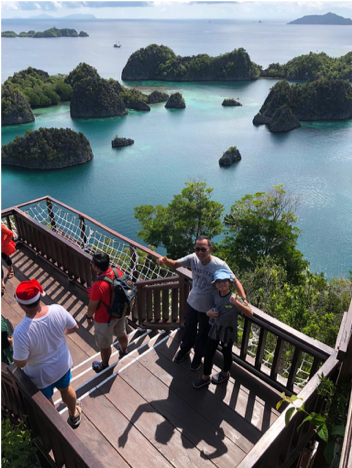 We just came back from a magical Christmas trip on the Blue Manta diving in Raja Ampat. It is a trip none of us are likely to forget: the boat is very well laid out, lots of space for everybody, all the facilities an underwater photographer could dream of, but what is more, Vincent and his entire crew are simply amazing! In fact the Blue Manta offers not just one, but at least three kinds of paradise; culinary paradise, diving paradise and massage paradise. Thank you for an extraordinary holiday! I will probably run out of Superlatives and exclamation marks in my praise of this first WM Similan trip this season. I am so happy to have chosen your company again after 6 years when I dived with the Black Manta in 2009. And as my luck would have it, I ended up on the boat with Chris who I had dived with before. He wasn't the tour leader then, but he is a superb one now! Organized, SAFE, caring , funny (his briefings were witty & entertaining ), a team player and passionate diver and lover of the marine environment (he has a special affinity to porcupine puffers!). He is top-notch! The rest of the dive leaders were excellent too. Mike, Kim, BJ, and Mark were always available, helpful , engaging and committed to the safety & enjoyment of the guests. Just overall fun to be around. I can't say enough about the crew. There are really not enough words to describe the friendly, cheerful manner in which they do their job. They take their duties serously, but do it in such a warm-hearted way. It made me laugh so hard when I could just stand there and the crew would almost completely gear me up for my dive, no effort on my part! The boat is so clean. The rooms spacious. Never have had such a large bathroom on a live aboard! The warm towels a luxury. The food was delicious and plentiful. The snacks, treats and desserts between dives were great expecially the brownies & mango sticky rice.... yumm mm my! The sun deck was relaxing and the boat felt so roomy and comfortable. Having been in the diving tourism industry for 10 years, I am viewing my wonderful experience from an acquainted perspective. I could go on &on &on with fabulous adjectives. The best compliment I can give is that I will be back!! Hopefully I can go on the new Blue Manta too then I will have tried each vessel. Thank you again to Max & Naffa for all your help in organizing my itinerary. If you ever need an assistant to help you out, I am officially applying for the position!! Just came out of the boat after a super week end thanks to the White Manta team. All the recipes for success are there: a great team, very professional from the Top to the ones you don't always see. Everyone is visibly doing their outmost for us to have a great time wile keeping a friendly and great relaxing atmosphere. The Boat is great and really super organised up to the smallest details to make diving a real pleasure in and out of the water. The food is incredible. I look forward to my next opportunity to spend some more time on this boat and highly recommend anyone looking for a good diving week end or longer outing. White Manta in the Similans, a fantastic choice for a diving holiday!!! Awesome crew, DMs & instructors! Very accommodating to make us comfortable on board despite ours being a crazy bunch. Informative and resourceful. Love the creative pre dive briefing. Passionate divers who are adamant in keeping the reefs safe from errant divers. Definitely, My next January holiday with White Manta in Similan. Thanx so much Mel, Michael, Mike T, Kim, and Andreas with many boat crews. You guys make my holiday so perfectly ! My only pick for a liveaboard! Absolutely Love the White Manta, it's facilities, the crew and especially the food!! My family and i recently took a trip on the white manta to the similan islands - nov 19-23. We had a wonderful experience - the diving was fantastic, the boat was great and the crew was incredible. I brought my children along for the trip - i have a 14 year old first time diver and two younger kids that snorkeled. I just wanted to send you a personal note to let you know how great the staff on the boat were - they were highly professional and very safety conscious. this was very important to me given that i had my kids along and my oldest son was a first time diver. Also, the crew was very accepting of having the children on board and were really warm and playful with the kids. The divemaster, chris hutton was incredible with the kids - he took them snorkeling in between dives - the kids loved him! Mike and Melanie smith were also incredible with the kids. We had the diving vacation of a lifetime that far exceeded every expectation: diving with Hammerhead’s, Thresher, Bamboo and reef sharks as well as Mantas and Pygmy Devil Rays in one vacation. It was fantastic but to be given the opportunity to use the boat ribs to enable us to snorkel close up to the Minky Whales and Dolphins as well was simply absolutely awesome. The professionalism and flexibility of your boat and diving crews and the skills of your chef to prepare first class cuisine that suited all tastes and incorporated unplanned locally available and on-board catches has been unprecedented. Never before in our long experience of live-aboard diving worldwide, have we been so impressed. I have been diving for the last 18 years and I must say that this has been one of the best diving trips which I have been on. Cedric is a great dive director, very friendly, knows the region well with a good knowledge of the currents ands tides dictating when to do the dives. Very reassuring as we were all a bit apprehensive about the current we saw and the region is known for. The diving was amazing where we saw mantas on 3 days of our trip. Anton our DM was excellent, making sure that my girlfriend, being a beginner was always ok. He really is a great person and DM. Really felt good with our little group of 4 diving. I have been to quite a few amazing dive locations but in the end it is the crew and the vibe on board which makes all the difference. The crew was always helpful, cheery and a pleasure to be around. It was great to chat to Cedric, Anton and Stanley about their previous adventures, with Stanley being an expert in finding small critters all the time. All in all it was a fantastic trip, great location, crew and diving. First off, thanks for a pretty damn great weekend! Yes the whale shark was a highlight but it would've been a great weekend nonetheless. Thanks for doing a write-up of the trip! I think those who didn't see the whale shark the first dive were so anxious (that it wouldn't be around) and eager (omg what if it's still there!!!) to do the second dive - I was so excited that I forgot to zip up my wet suit and only realized it mid dive when things were biting me! And I remember it was almost a race for us to fin towards the front of the boat to see who would get there first. Will definitely dive with you guys again! This was my forth trip with the White Manta and it's crew - and it will definitely not be my last. What attracts me is the excellent dive sites, the professional and experienced crew, the superb food and the relaxed atmosphere onboard where you meet and get aquatinted with new diving friends. I have been onboard together with friends and family and I have signed up just me - and it both works as you either get paired up with your friend or a new buddy sharing your own passion for diving. The dive deck is well organized and the same can be said about the process of going in and out of the water associated with it. The dive sites are well worth a visit, reef dives, wreck dives and on the last trip even Jack Rock presented itself from the best side with visibility close to 15 meters - what an experience! All in all - highly recommendable! The crew on the boat are some of the sweetest people I have had the opportunity to meet since living in Asia. Mostly a Thai crew (so you can just imagine the food I am treated to, we will get to that shortly) and headed up by the lovely Chris. Chris is a Dive Master extraordinaire and marine life enthusiast with the best arsenal of “What's That Fish?” books I have had the privilege of rifling through! I love meeting people that are passionate and all consumed by that they do for a living, and that is Chris. It is hard not to get wrapped up in the magic of diving when you are with him. Just a quick note to thank you and your amazing team on the White Manta for a great weekend of diving. Although the conditions were challenging I thoroughly enjoyed it and it has definitely re-sparked a forgotten passion for diving. I really do look forward to another adventure in the near future. We thought the boat was very well organized, very clean and the crew was very friendly and extremely helpful. The food and massage was also excellent. In particular, the dive platform was very well designed. We've been on several high-end liveaboards: The Seven Seas, N'aia, Peter Hughes and 5-6 Aggressors. And, we've been to WAKATOBI, Kasawari and other high-end resorts. I used to be a PADI Open Water Instructor and US Coast Licensed Captain. And, I captained a 45’ dive/sail motorsailer in the Caribbean over 2 yrs. in the early 80's. Why I'm I telling you this? Because I want you to know that I’ve "been around" and I consider Chris Hutton to be one of the best Cruise Director's I've encountered. He had a "full plate" and managed it like a true professional. He also went the extra mile for us after we disembarked and helped find us a better hotel, at a cheaper price and probably the best local dive operation available in KK. Here are some recommendations: The bathroom door could have used a door latch to allow it to stay open (like the outer door) A mirror over the desk in the stateroom would have been a nice addition. Some form of fiber-rich food like oatmeal, rye crisp, etc. would have helped us older folk for breakfast. First, let me just say the trip, divemasters, food, boat and the crew were all amazing. We had an excellent time and I just can't say enough positive things about it! We have been gone for four hours, and I've already met another couple who I recommended White Manta to, I should have left with a stack of business cards. Having been in the hospitality industry we know how much time and planning goes into the logistics of such trips, and dealing with people and their various needs and requests is not easy. Max, as always you are quick and efficient in your dealings and correspondence. Thanks too for co-ordinating our Dive course materials and our practical dives with Mike during our trip. As I'm sure you are aware, we have just received one of our Dive certificates and eagerly await the other 2 once you are able to have them signed off by Mike. Last but not least, Chris. Your briefings and reconstructed reefs were great. You manage a good team. Your Dive staff are as always helpful and friendly. The ladies did a great job of all housekeeping aspects. The Food was absolutely fantastic. It a remarkable achievement cooking such yummy food, in limited space, and creating varied and tasty food selections for so many people. Good Job Guys and Gals. Looking forward to joining you in the not too distant future. Hope to catch up for a casual drink when next you guys are in Singapore.